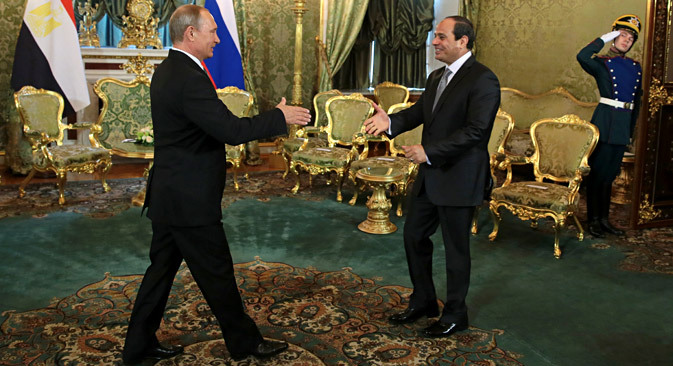 Press Digest: How realistic are Putin’s aims to forge close ties with Egypt? RBTH presents a selection of views from leading Russian media on international events, featuring analysis of Egypt’s potential as a future close trading partner for Russia, as well as reports on recent emigration statistics in Russia and the objections of Belarus to the construction of a Russian air base on its territory. Will Egypt become new Ukraine for Russia? During his meeting with Egyptian leader Field Marshal Abdul Fattah al-Sisi, in Moscow on Aug. 26, Russian President Vladimir Putin said that the Eurasian Economic Union and Egypt could create a free trade zone and switch to national currencies in mutual trade in the future. The internet news outlet Svobodnaya Pressa writes that Moscow is interested in the Middle Eastern market and in moving away from the dollar in foreign trade transactions. “Trade – and nothing else. There is no mention of any union or strategic rapprochement at all in the words of the Russian president, contrary to the Soviet era,” the publication writes. Al-Sisi has conceived the “construction of the century” – the expansion of the Suez Canal – for which he needs financial support. Egypt has a poor credit history and the West is not giving any money for the project, so al-Sisi is appealing to Russia. But today’s Moscow is not going to repeat the mistakes of Nikita Khrushchev, who lent money to Egyptian leader Gamal Abdel Nasser, only for his successor to then fail to return the debt and take a completely opposite course – toward forging closer ties with the United States. Egypt is also unable to become a sincere friend of Russia because of its huge debts, which have made it totally dependent economically (like today’s Ukraine) on the West. According to the state statistics agency Rosstat, 170,684 people left Russia in the first half of 2015 (compared to 203,000, who left Russia in the last seven months of the previous year). However, it turns out that 85 percent went to CIS countries, especially Uzbekistan and Tajikistan, meaning that this is labor migration, and not a brain drain, writes Komsomolskaya Pravda. “In total, 278,000 came to Russia from abroad in the first half of the year against 170,000 who left, i.e. a migration increase of more than 107,000 people!” exclaims the newspaper. Meanwhile, the number of people who left to Germany, the U.S., Canada and Finland this year exceeds those who arrived from there only by 786 people. Last year’s figure was higher by 1,862 people. Russia has reminded Minsk of its plans to establish a Russian air base on Belarusian territory, where a regiment of Sukhoi Su-27 fighter jets would be deployed, the news website Gazeta.ru reports. “This is an unpleasant moment for [Belarusian President] Alexander Lukashenko; Belarus is now in the midst of a presidential election in which the head of state has positioned itself as the only guarantor of independence,” writes Gazeta.ru. The publication writes that a significant part of the Belarusian population is scared by the events in Ukraine and does not want the appearance of “little green men” wearing Russian uniforms on their land. Like the Belarusian opposition, Lukashenko is against any foreign military presence in the country. His opposition to the construction of the Russian air base puts Lukashenko in quite a favorable position ahead of the election. However, if it refuses, Belarus risks losing the economic support of Russia, which by some estimates amounts to 20 percent of Belarusian GDP.